It was a symbolic transition for the world’s fourth-largest media conglomerate when its name changed to 21st Century Fox in 2013. Formed by the splitting of entertainment and media properties from News Corporation, 21CF, its official abbreviation, deals primarily in the film and TV industries, counting movie studio 20th Century Fox and the Fox TV network among its assets. But the recent overhaul of three floors of its corporate headquarters in New York is more meaningful for the long run, presenting an updated face to the world, and its own employees. 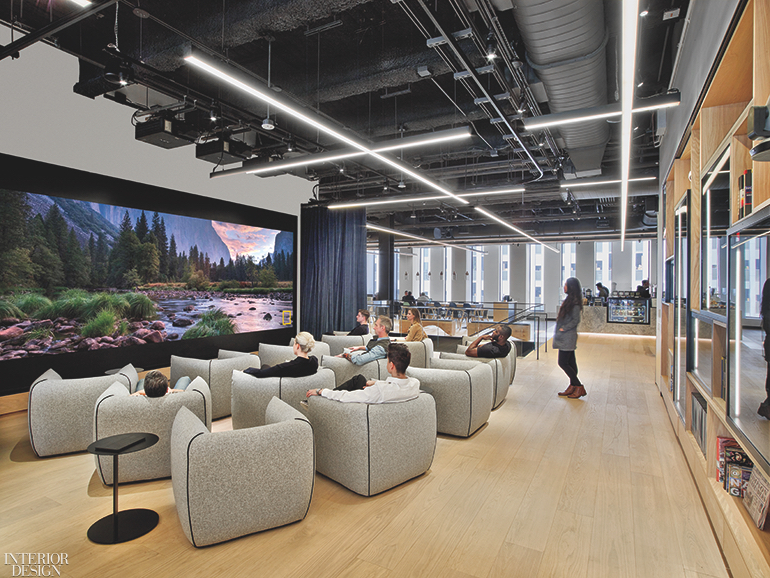 Gensler transformed what had been a traditional workplace—think perimeter offices and plasterboard walls—into a buzzing open plan that looks more downtown than midtown, the latter its actual geographical location. And, don’t tell Fox News, it feels just a touch European. “It’s a drastic departure from where they were,” Laurent Lisimachio says. The Gensler principal and design director spearheaded the project, which encompasses 150,000 square feet across three contiguous high-rise floors, with reception, private executive areas, and staff amenities at the top. The levels are connected by a floating staircase in cast concrete, glass, blackened steel, and white oak, its spine lined with LED strips. Antonio Citterio designed the task chair in an office area. Photography by Eric Laignel. The vision for the project came straight from the CEO of 21st Century Fox. “He told us, ‘We don’t want any walls, we don’t want any private offices,’” Lisimachio recalls. Not for him, nor any of the 300 employees working in the HQ’s TV ad sales, finance, and marketing divisions. True, there are conference rooms and an executive boardroom, but the latter’s table is a hefty slab of concrete that was poured in place on-site, and then hand-sanded smooth. Definitely not your father’s boardroom. From the start, the Gensler team knew the emphasis was going to be on the company’s high-profile product, not an overly assertive design. Restraint rules, with flooring of either engineered white oak or polished concrete, and blackened steel used as a sharp framing device throughout. Furniture and lighting are tasteful and discreet, with pieces by Antonio Citterio, the Bouroullec brothers, the Eameses, Arik Levy, and Eero Saarinen. The gallery features Wolfgang C. R. Mezger chairs and a 10-foot-long oak communal table. Photography by Eric Laignel. News Corporation began with newspapers, however, so text is a notable component of the project. Drawing from material as diverse as old Fox movie scripts to highly technical CGI code, branding firm Gretel turned it into attention-grabbing graphic oomph that revs up walls and other swaths of surfaces. Text blocks in the shape of the classic Fox searchlights, for instance, create a striking visual right at the entry, across from the reception desk. Armchairs by Francesco Bettoni gather in the screening area, on the other side of the gallery. Photography by Eric Laignel. Another marquee attraction is the screening area. But it’s not the typical enclosed-room format. Instead, it’s an open space in the midst of the executive floor’s amenity zone. “The vision was that it be seen by staffers walking by or visitors coming through reception,” Lisimachio explains. Employees often gather there for after-hours screenings, its plump armchairs by Francesco Bettoni particularly beckoning. When necessary, the area can be cordoned off with a heavy navy velvet curtain hung from a ceiling track, and the surround-sound technology is experienced via headphones worn by viewers. Indeed, plenty of the project is devoted to perks. In the executive floor’s central gallery, essentially a café, employees enjoy Stumptown coffee and sushi made by an in-house chef in the oatmeal-upholstered Wolfgang C. R. Mezger chairs lining a long oak communal table. 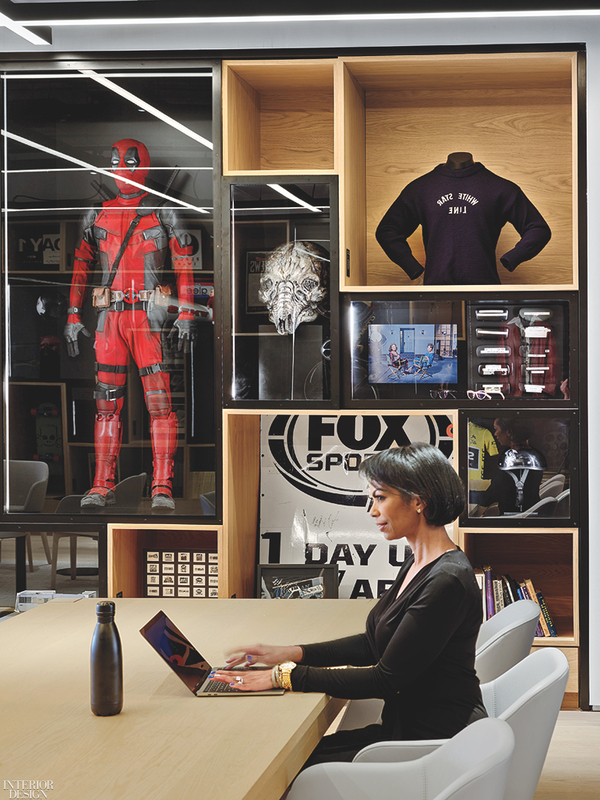 Nearby, nearly an entire wall is devoted to a custom display case filled with additional movie, TV, and sports memorabilia, from the life-size Deadpool costume worn by Ryan Reynolds and props from the popular Glee series to a Tour de France racing jersey. A costume from the movie Deadpool is among the memorabilia inside the gallery’s custom display case. Photography by Eric Laignel. Then there’s the 15,000-square-foot fitness center at the base of the building. Exclusively for Fox and News Corporation employees, it features a juice bar framed by a wall of cascading ivy, a screen made from resistance bands, and changing rooms with super-size numbers on lockers. 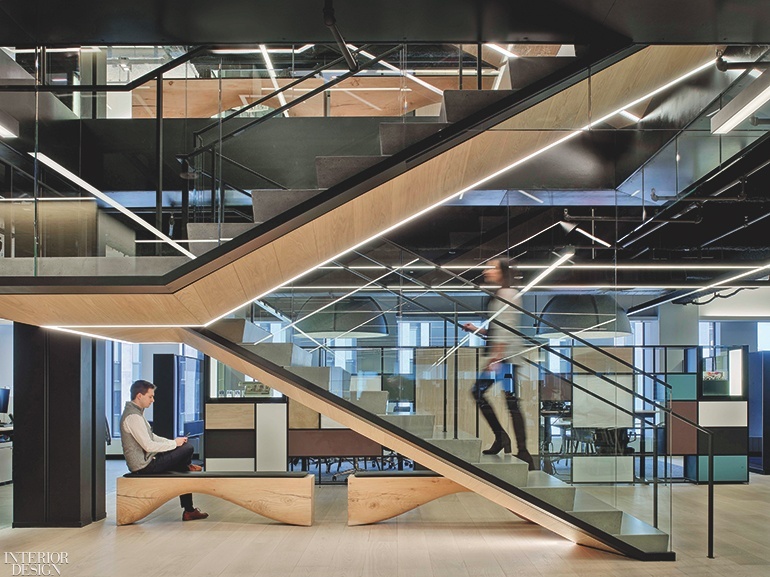 Although not connected with the three work floors above, the gym feels very much a part of the overall scheme, since Gensler maintained the same oak-and-steel palette. Speaking of work, the office areas back upstairs are streamlined and up-to-date. Everyone has a sit-stand desk. Instead of being lined up in endless rows, however, they are arranged in “neigh­borhoods,” Lisimachio says, with storage/display systems partitioning while adding touches of sophisticated mauves and blues. “It feels very human.” Contributing to the human factor are the domed gray felt pendant fixtures controlling noise levels. But for this workplace, a hearty round of applause is in order. Ronan and Erwan Bouroullec designed an office area’s sit-stand desks. Photography by Eric Laignel. Project Team: Tom Krizmanic; Juliette Poussot; Larissa Hennessy; Wade Laing; Marcella Malcotti; Jonathon Gottlieb; Leslie Nardini; Dagmara Gutorski: Gensler. Gretel: Custom Graphics. HDLC Architectural Lighting Design: Lighting Consultant. TAD Associates: Audiovisual Consultant. Axis Design Group International: Struc­tural Engineer. AMA Consulting Engineers: MEP. M Cohen & Sons: Stair Contractor. Gardiner & Theobald: Project Management. Benchmark Builders: General Contractor.